Gambling can be very addictive, and it is advised to quit while you're ahead! 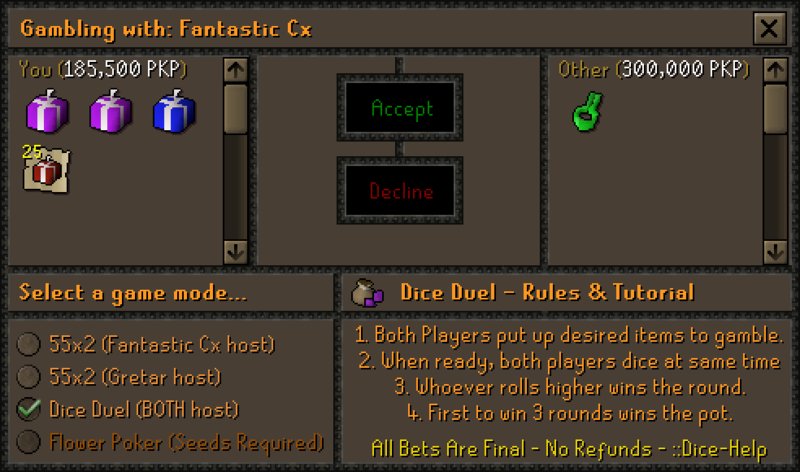 Note: All gambling bets are FINAL and there will be no refunds under any circumstances! Gambling is at your own risk! The most popular dicing method is the 55x2 Dicing. - The Dice Host rolls the die. - If the number rolled is 55 or greater, the dice host LOSES the gamble, and the pot goes to the Client. - If the number rolled is lower than 55, the Dice Host WINS the gamble, and the pot goes to the Host. 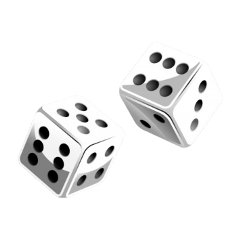 Dice Dueling is also a well known gambling method, and it involves two players dicing against each other, instead of only 1 person throwing the die. - Both players rolls the dice at the same time. - Whoever rolls the highest number gets one point. Player A wins a point, making the score 1-0 in Player A's favor. Once one of the players has THREE points, they win the gamble. If both players roll the same number, it is a Re-Roll. Flower Poker is a very popular gambling method. It is similar to the ways of actual Poker, where each player must have a better "hand" than the other to win the pot. It involves betting on what colour flowers will emerge from mithril seeds planted by the hosts. 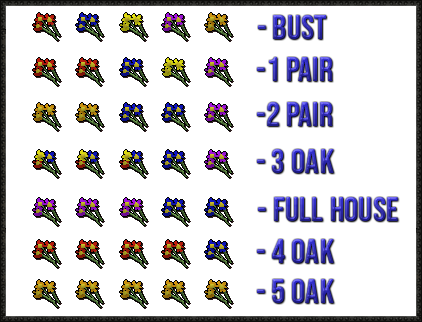 5 flowers are planted, and the player with the best pair wins the pot. If both players end up with the same hand, you Re-Plant. White and Black flowers are a lot more rare, and planting one of these will result in a Re-Plant. I hope this guide gives you an insight in how these 3 forms of gambling works! Have fun gambling, and best of luck in your gambling endeavours!